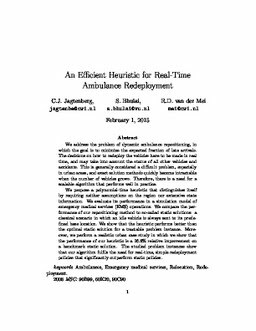 We address the problem of dynamic ambulance repositioning, in which the goal is to minimize the expected fraction of late arrivals. The decisions on how to redeploy the vehicles have to be made in real time, and may take into account the status of all other vehicles and accidents. This is generally considered a difficult problem, especially in urban areas, and exact solution methods quickly become intractable when the number of vehicles grows. Therefore, there is a need for a scalable algorithm that performs well in practice. We propose a polynomial-time heuristic that distinguishes itself by requiring neither assumptions on the region nor extensive state information. We evaluate its performance in a simulation model of emergency medical services (EMS) operations. We compare the performance of our repositioning method to so-called static solutions: a classical scenario in which an idle vehicle is always sent to its predefined base location. We show that the heuristic performs better than the optimal static solution for a tractable problem instance. More- over, we perform a realistic urban case study in which we show that the performance of our heuristic is a 16.8% relative improvement on a benchmark static solution. The studied problem instances show that our algorithm fulfils the need for real-time, simple redeployment policies that significantly outperform static policies. Keywords Ambulances, Emergency medical services, Relocation, Redeployment.